Are your relationships all that you want them to be? Do rough patches ever catch you by surprise, causing you to think Why is it so hard right now? Why is there tension? Was it something I did?Despite our best intentions, we all have blind spots—bad relational habits that are keeping us from enjoying our relationships fully. And since relationships stand at the center of all we do, if we can learn to do relationships even fractionally better, every aspect of our lives improves. Whether you struggle to overcome past wounds, insecurity, blame, or envy, it’s time to reflect on your relational habits and reset. An experienced counselor, Dr. Laurel Shaler is passionate about helping women thrive in all of their relationships. 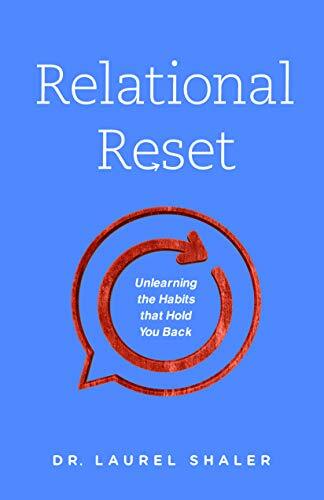 Relational Reset will reveal unhealthy patterns that may be holding you back, give you practical steps for improving your relationships, and help you find your ultimate security and identity in Jesus Christ. When you reset your relationships, you honor God, yourself, and the ones you love. What are you waiting for? Join in the conversation with Dr. Shaler and I at 929-477-1965 and press 1 to be live on air. Or, click on the link here: http://tobtr.com/s/11181155. As a counselor, professor, social worker, speaker, and writer, Dr. Laurel Shaler’s goal is to live out the words of Isaiah 61:1-3…To proclaim good news to the poor, to bind up the broken hearted, to proclaim freedom for the captives, to release prisoners from darkness, to comfort all who mourn, and to bestow joy! Why? Because at the age of 18, Laurel experienced a life changing event when it was discovered that she had a 14 pound ovarian cyst that needed to be removed before it ruptured and killed her. Realizing that we must anchor all our emotions to God, her desire is to help others work through their own challenging experiences and grow in all areas of their lives, including faith. In order to help others in this way, Laurel earned her Masters in Social Work from Florida State University (and is a Licensed Social Worker) and earned her PhD in Counselor Education and Supervision from Regent University (and is a National Certified Counselor). She also holds a Master of Arts in Theological Studies from Liberty University. Laurel has provided psychotherapy services to hundreds in need, many of whom were veterans of the United States Armed Forces. She is now an Associate Professor and Program Director at Liberty University. She is a member of numerous counseling and social work organizations, and actively presents and publishes. In addition to other professional interests, Laurel speaks and writes on the intersection of faith, culture, and emotional well-being. Laurel has been published professionally and in the well-known Extraordinary Women, P31 Woman, and Lifeway’s Journey Magazines. In addition to maintaining her own blog, she writes for Patheos, and has written for the American Association of Christian Counselors and “Coffee Break” (out of Thomas Road Baptist Church). She has also been a contributor for Believe.com, the Ethics and Religious Liberties Commission of the Southern Baptist Convention, To Save a Life, Bound4Life, and For Every Mom.